Today I have for you sandwich #6 from Emeril Lagasse’s Kicked-Up Sandwiches Cookbook. This was the first sandwich that I actually made from him and I thought it would be my favorite, but now I can’t decide. You know from my personal past recipes, how much I love Caprese sandwiches, so I had to create Emerils and you know what? I love it!! Yah, yah, I know your not surprised!! 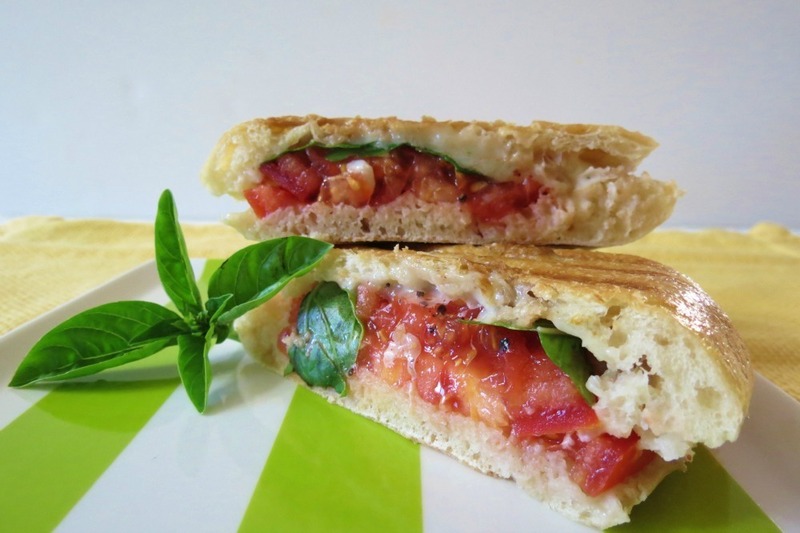 This sandwich is made on Ciabatta bread, and to keep the calories low I took out the center of the bread and stuffed it with fresh tomatoes from my garden. Yum!! Emeril’s sandwich had a basil pesto type spread on it, but I kept it fresh by adding fresh basil from the garden. This sandwich is simply amazing! One of my all time favorites. I know why but I can’t get enough of tomato and basil together! Hey, I forgot to mention, do you like my green plate? Little Jenny bought it for me for Mother’s Day and she has been waiting for me to use it. I thought this sandwich was perfect on it!! It’s one of my favorite shades of green! 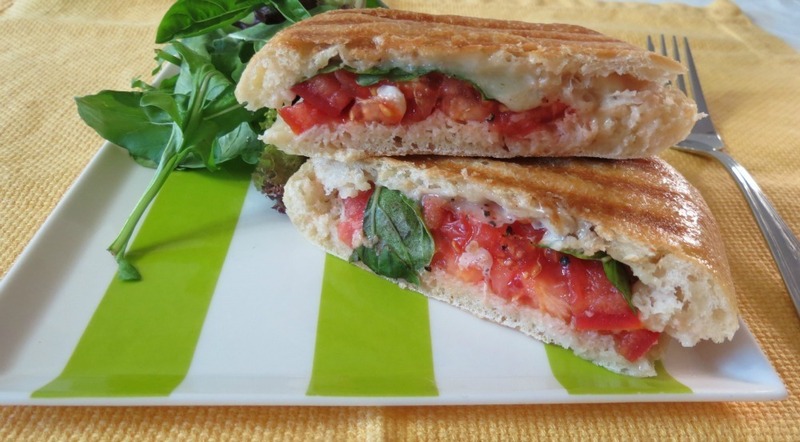 Now, I can’t post the recipe to this sandwich, but I was googling on Emeril’s site and I found a fabulous recipe for Individual Baked Tomato Mozzarella Cheese and Fresh Basil Pies, and that recipe is very similar to this recipe. I love that for the pies he used puff pastry! I so have to make that!! It sounds wonderful!! I only have one more sandwich to make and my Serious Sandwich Kickoff is over! 🙁 I want to share with you the list of all participating bloggers. You should check them out!!! There a great bunch of bloggers that I have the honor to virtually meet! Emeril answered your question. You may post this on your blog. EMERIL: I take inspiration from just day to day life – many times it comes from what I see in farmer’s markets and grocery stores while shopping for dinner. I also get to travel a lot for work these days, and I always return from a trip with new ideas and inspirations. 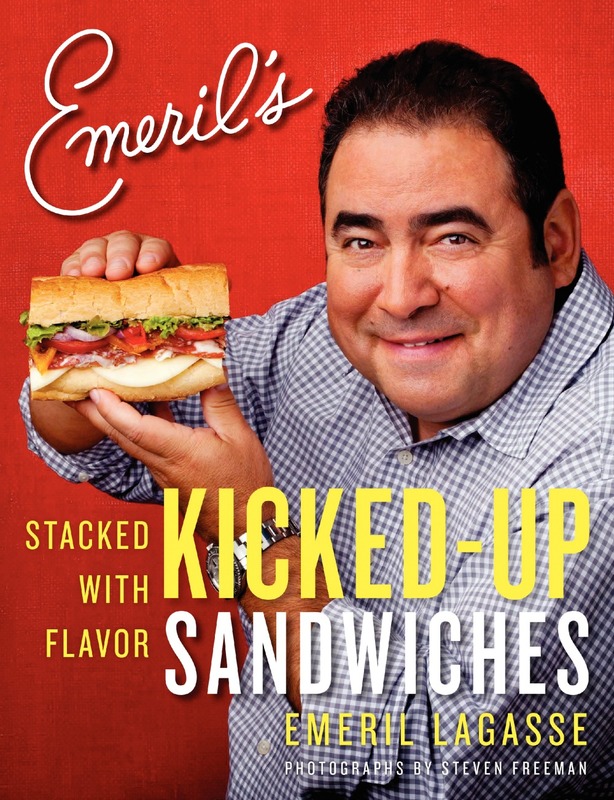 Emerils book is now available! If your interested in purchasing it you can go here. If your curious and you want to see what other goodies are in the book you can go here. Also, check out the Serious Sandwich pintrest page, there are new Emeril Sandwich recipes being added everyday and some have recipes with them!! Yah! I love the idea of using a puff pastry! I did something similar to that once where I filled the pastry with avocado, tomato, and mozz. It was great and I loved the lightness of the pastry. I never worked with puff pastry but the idea of it with a sandwich or appetizers I love! I have to try it! Nice idea on hollowing out the ciabatta. Thanks! Hollowing it out makes for more goodies to put in the center!! Yum yum yum! Caprese is my FAVY sammy. also love ciabatta bread. it’s so tasty. This is sandwich is a fave. Looking forward to next summer’s heirloom tomatos so I can make it again! I know I miss my summer garden already!! We have to do lunch sometime!! But your cooking! 🙂 I LOVE your recipes!! 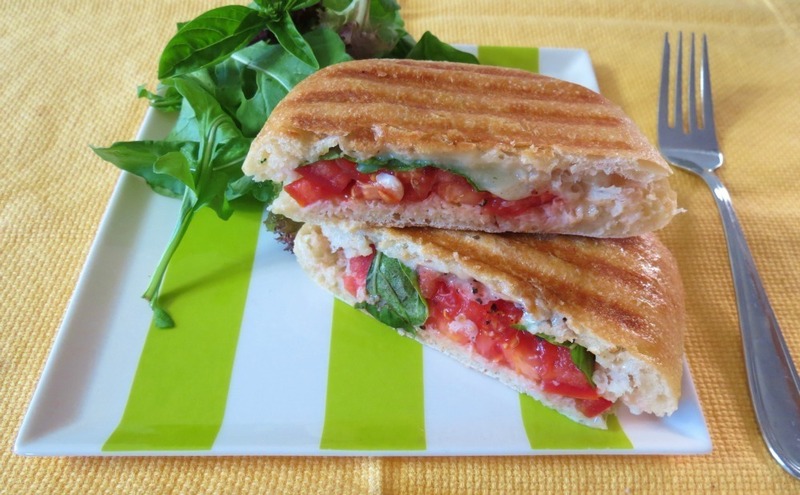 It’s amazing how such simple ingredients can make an amazing sandwich! Yum! I know, it’s crazy!! I love it! Love caprese! This looks so yummy! Thanks Stephanie! It’s one of my all time favorite sandwiches!! Hollowing out is sometimes needed but I always feel guilty because I love the bread part the best! It was great meeting you last night, hope you had an awesome day today, I’m really bummed I missed it! It was so nice to meet you!! Well have to hook up again sometime!! I wish you could of went to the gala, it was just gorgeous in there! That was the best part of the event! Thanks Addie! Love your name!